Do you remember when you were a teenager, going to school, hanging out with your friends, and your only real worry was what your Friday night plans would be? 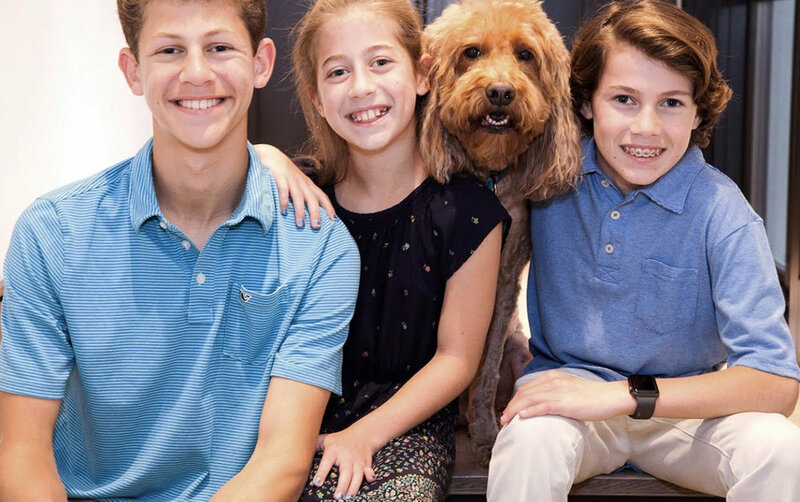 Well, it is a completely different story for these young entrepreneur siblings, Sam, Ben, and Molly. They started Knead Love Bakeshop to make sure they were giving their dog Penny the healthiest treats. They created an organic, all-natural, delicious recipe, but they weren’t stopping there! With them just being kids, they wanted the process to be easy and fun. They created a simple 4-step process that leaves your kitchen mess-free! Being a mom myself, nothing makes me happier! Can you tell us more about sweet Penny? She’s a 9 year old Goldendoodle. She’s super easy going and loves being around the family. Penny is really lucky, she’s our #1 test taster….and we are baking up fresh batches nearly everyday. I am sure our vet is going to be a little surprised next time Penny steps on the scale! Who or what influences you all the most? Our grandparents. We’ve always loved baking cookies with them and realized that while the cookies were good, the experience was great! They are amazing role models and have always been our biggest supporters. They love to show up and help us fill orders. What are some other dog treat brands you love and why? All of the organic treat brands. We have always been very careful and what we feed Penny, and know that the organic treats are the most healthy. Anything new we can expect coming up this year?! Yes! On a regular basis, we will be launching new flavors. We will also soon be launching grain free options. And, lots of pet related charity fundraisers! What are some of your favorite animal related charities that you guys contribute to? Right now, we are making a donation to the American Humane Society for EVERY order through Valentine’s Day. We are also giving our customers the opportunity to make an additional donation. Soon, we will be launching a campaign for Dogs for our Brave…. It’s an amazing organization! Now that you know more about these remarkable kids, it’s time to show you just how easy the process is! I love how simple it is to make these healthy treats for my Doodle, and my 8 year old son was able to help along the entire process! You just add water, knead the dough right in the piping bag, pipe the treats onto the baking sheet, bake for 30 minutes and voila! You can even store the treats right in the container the mix is shipped in! They currently have 3 delicious flavors, but are working on more! This family and their vision just blow me away! Stay tuned for all of the exciting things Knead Love Bakeshop will be launching this year on their website and make sure to follow their instagram!